The Future of Genesis - Luxury SUVs and Sports Cars on the way. For years, Hyundai insisted they never had plans to break their luxury Genesis lineup off into a separate brand. But the midsize genesis G80 and full-size G90 got so popular, a separate brand became necessary. Soon, the luxury brand will be getting a new addition – the G70: a compact and sporty competitor to the BMW 3 Series, Mercedes C-Class, and Audi A4. Hyundai’s Genesis brand is getting serious about becoming a real rival to Germany’s three dominant luxury car brands. The G70 is based on the same rear-wheel drive platform as the newly announced sports sedan from Kia, the Stinger. However, the G70 opts for more of a traditional luxury-car styling instead of the hot, sportier look of the Kia. The G70 gets the same engines too—a 2.0-liter turbocharged four-cylinder that cranks out 255 horsepower, and a 365-hp turbocharged 3.3-liter V6 engine. Genesis also plans to offer a 2.2-liter diesel engine option for the G70, but it is unclear whether that will be available in the US market. 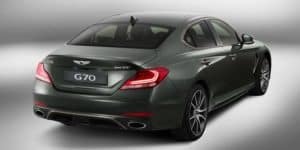 The G70 is equipped with an eight-speed automatic transmission, but the base four-cylinder engine also comes with an available six-speed manual transmission. 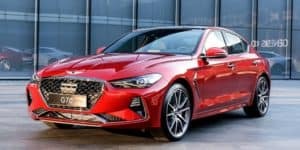 And Genesis says the top-of-the-line V6-powered G70 Sport runs from 0-62 mph in 4.7 seconds, which impressively beats out both the Kia Stinger and BMW 3-series. The G70 also gets launch control, torque vectoring, multi-link rear suspension, and a mechanical limited-slip differential. There’s also a custom mode that allows you to set the engine, transmission, suspension, and steering calibrations between Comfort, Sport, or Eco modes. 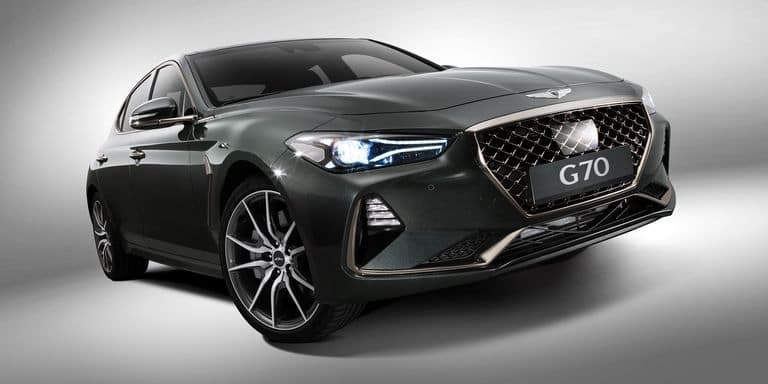 Since the G70 has to contend with such lovely luxury powerhouses, it also gets a very nice-looking interior and exterior on top of all the power. It’s silhouette is more coupe-like than the 3 Series and A4, making it look sleeker and sportier. In the rear, the G70 features muscular rear haunches that make it look wider and more planted than its competitors. The front end features a grille similar to the one found in the larger G80 and G90 sedans, and it’s flanked by a pair of LED strips inside the headlight cluster, which give the front fascia a bit more width. LED accent light strips that also double as turn signal indicators flank the G70’s lower front fascia along with some functional air intakes. The rear end features two exhaust tips and LED taillight clusters that blend together with the muscular rear haunches and fender flares. Inside you see a driver-centric layout with a center stack that’s ever so slightly turned toward the driver. Touch and feel everything and you’ll notice a lot of high quality quilted leather and real metal accents on the doors and speaker grilles. When you take a seat, the supportive front seats offer extensive adjustability and plenty of support and comfort for any long-distance trips. US-market G70 specs and prices will be announced early this year, but it looks like it is shaping up to be another great addition to the Genesis Lineup. Stay tuned to our social media for updates on when to expect the G70 on our lot! Its G70 sedan seems like it could be a real BMW 3-Series rival, and it confirms that they are serious about developing performance cars too. Speaking to Australia’s Wheels Magazine at CES, Hyundai design VP Luc Donkerwolke and Research and Development head Woong-chul Yang confirmed that Genesis is also developing a sports car! Yang confirmed that Genesis wants to develop a two seater sports car and they want the project to be handled by Hyundai’s N performance division. The N division, led by former BMW M boss Albert Biermann, already has a notch in their belt with their the i30 N hatchback. If they can develop a hot hatch as good as the i30 N, a full on sports car in their hands is incredibly promising. The Genesis sports car should be a hybrid of some sort, but it sounds like the engineers are still working on powertrain details. Other than that, though, details are slim but whatever Genesis is aiming for in this car, we are okay with it! It sounds like Genesis is serious about making something that’s luxurious and fun to drive, but fun doesn’t always mean sports car; Genesis also confirmed that by 2020 two SUVs will also join the lineup. Currently, the two SUVs scheduled to arrive by 2020 are the GV80 and the GV70. The GV80 is expected to be a larger luxury SUV, perhaps even including a 3rd row similar to the Hyundai Santa Fe. The GV70, like the upcoming G70 coupe, is expected to be a smaller, more midsized SUV similar in size to the Hyundai Tucson. 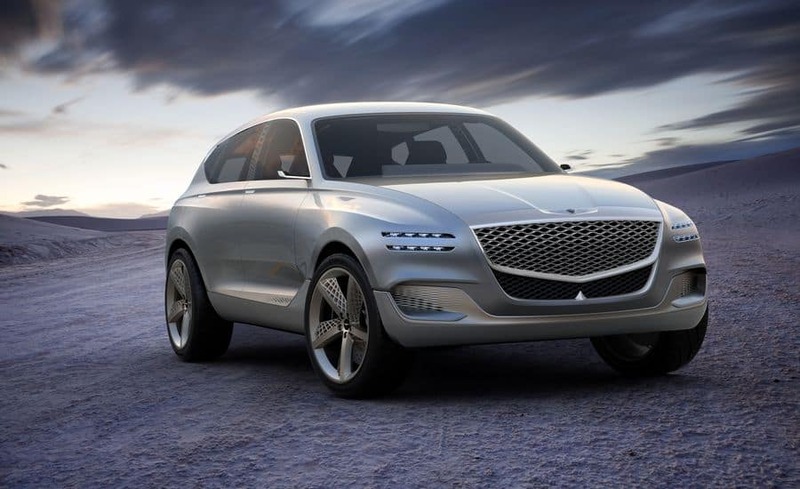 Crazy enough, now it even looks like a third Genesis SUV is on its way! Genesis hasn’t confirmed the size of the third utility vehicle but considering how popular compact crossovers are, and the recent introduction of the Hyundai Kona CSUV, it would make a lot of sense for Genesis to want a vehicle to fill that hole in its lineup. 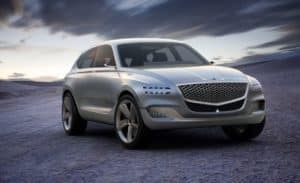 Automotive News reports that Genesis will likely launch a compact crossover in 2021. Manfred Fitzgerald, global head of the Genesis brand, spoke with the news outlet, saying that while a lot of people still don’t know Genesis is its own brand, he believes entering more segments will help change that. Genesis is one of the most promising new car brands today. If Genesis really does expand to a 3 SUV, 3 Sedan, 1 sports car lineup, it will theoretically be one Luxury Truck away from becoming the world’s most well rounded and extensive luxury car brand. The amount of new additions coming to Genesis is staggering, even on paper, but we promise we aren’t making any of them up. If Genesis does expand to a 3 SUV, 3 Sedan, 1 sports car lineup, it will theoretically be one luxury pickup truck away from becoming one of the world’s most well rounded and extensive luxury car brands. And you can be sure we will be here to keep you informed on the way! Keep up to date with our blog and social media for news and information on Genesis and Hyundai, we are on facebook and twitter! If you are interested in a Genesis now, we have dozens of G80s and G90s in stock and ready to find a new home. Check them out online at HyundaiofLouisville.com or give us a call at 502-214-4200. 2 comment(s) so far on The Future of Genesis! Like the car. If it lasts like it looks I will be a long time customer. I also just showed the car to a friend and he is now buying a Genesis also. Great job in styaling and engineering. The options sold me over Infinity and Lexus.